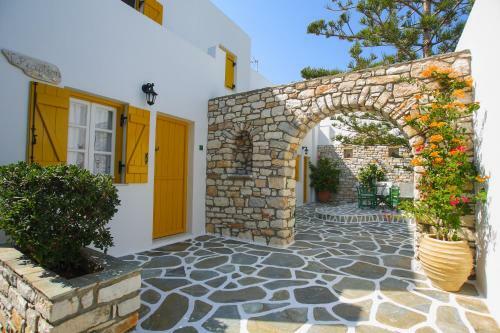 Ostria is located near the beach in Naoussa, Paros. The hotel offers to its guests garden. The property provides accommodation in triple room, double or twin room, family room, 1 bedroom apartment and other might be available upon request. The rooms provide garden view. Room amenities include air-conditioning, heating, fridge and more. Each unit has own bathroom with hairdryer. In the kitchen there are fridge and kitchen utensils. Free Wi-Fi is available in common areas. Pets are allowed on request and extra charged.